You might not find a lower price! 4-pack AA Duracell Procell batteries. Each order will contain 4 AA batteries (if you order a quantity of 1 you will receive 4 batteries, 2 and you will receive 8 batteries, etc.). These can be used on our P1200 Control Desk, P12, P4, R4 and MS32Q series of firing systems. 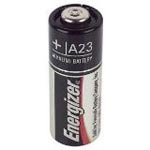 Energizer A23 Battery. For use with P12 or R4 wireless firing system.